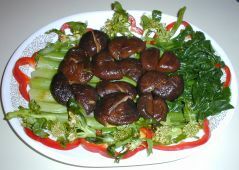 To celebrate the New Year in 2007, Madame Yee Yo, who is the author of several books , including You Can Cook Anything Chinese: Simpler and Surer by Eleven Cooking Methods , brought this colorful and delicious arrangement of Chinese broccoli with mushrooms to our party. Soak mushrooms in cold water overnight. Discard liquid and stems. Simmer the mushrooms for 10 minutes. Peel broccoli stems. Scald in a pot of boiling water for 1 minute. Cool in cold water immediately and squeeze out excess water. Marinate the broccoli and mushrooms for 10 minutes in the dressing. Arrange slices of red pepper on a platter. Cut the broccoli stems across 2 or 3 times, and place over the pepper slices. Cut the mushrooms in half, and arrange them on top of the broccoli. Sprinkle any remaining dressing on the vegetable arrangement.